The Rex Grossman Era is officially ov... Wait, what?! It was supposed to be over. It WAS over. When Lovie Smith benched Grossman in lieu of Brian Griese after Week 3's game against the Cowboys, that, for all intents and purposes, was it for the former Florida quarterback. But then Griese, as career backups tend to do, struggled as well, and when Griese was injured against the Raiders, Grossman came to the rescue. Griese's mysteriously ailment kept him out of the following game, opening the door to Grossman, and to be fair, Rex played a consistent mediocre for the next several games. It was no longer over. There was talk about how to handle the situation this off-season, but Grossman appeared to take care of that, as he, through no fault of his own, once again found himself on injured reserve. The door was shut and the key was hidden in Kyle Orton's beard. That was that, right? But these last several weeks, quotes had been coming out of both camps that Rex wanted to give it another go with the Bears... and that the Bears were open to it. Now here we stand, with Grossman signing a one-year deal and a chance to compete for the starting quarterback position. And after the sense of nausea finally subsided, I think it was the right move. Lack of Options for Rex - With the number of quarterbacks to enter the league the last several years and the number of solid signal callers expected this April, the probability of Grossman going elsewhere to assume the starter role seemed remote at best. Most likely, Grossman would be asked to compete for the job, so if he was going to compete anyway, why not stay within a system with which he is familiar? Weak Free-Agent Quarterback Class - For all the criticisms of Grossman, he's got nothing on most of the free-agents floating around. Have you seen this list? 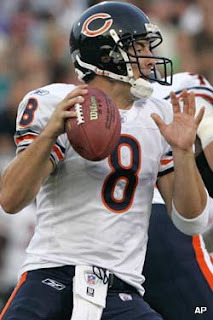 It's headlined by Derek Anderson, whose late-season decline should have the Browns concerned and Brady Quinn ecstatic. And improbably, the talent level drops significantly after him. Daunte Culpepper? Byron Leftwich? Trent Green? What year is this? Lack of Trade Options - Donovan McNabb is the name most often included in trade conversations, but how much would the Bears have to give up to get McNabb? In case you haven't noticed, the Bears currently have a lot of holes, and sending draft picks over to the Eagles for a quarterback who has missed three to seven games in each of the last three seasons isn't going to solve that problem. And what does Philadelphia need? Wide receivers, of which we currently have none. The other alternative I have heard is J.P. Losman, but he's essentially the Buffalo version of Grossman anyways - skilled but erratic - and not exactly an upgrade. Surveying the rest of the teams, it doesn't get any prettier. Grossman Struggles - This is the option most of us believe has the highest probability of occurring. In this scenario, Grossman either leads the Bears through another sub par season or finds himself on the bench in favor of Orton. Easy enough, end of season, and the Grossman story is over without any impact to the salary cap. Really this time. Grossman Succeeds, Re-signs - The best case scenario is Grossman finds the magic that carried him through the first half of the 2006 season (Arizona game, excluded). The Bears tag and/or re-sign Grossman, hoping to build upon his newfound confidence. Grossman Succeeds, Leaves - We've all learned that in sports, loyalty only goes so far, so what if Grossman miraculously puts forth a Pro-Bowl performance, highlighted by his extraordinary stats despite the lack of a receiving core? You don't think another team would want to sign him? Well, thank you for your time, Rex. We now turn the team over to 2nd-year quarterback-to-be-named and once again roll the dice. So in the end, it is not what I expected, but all in all, not the worst of choices. This now becomes a one-year salvage experiment with little to lose. Grossman is the best of a bad set of options. Succeed and we all prosper, fail and the Bears cut their losses and move on. So Grossman gets at least $3M he probably does not deserve, but he and Orton together provide whomever the Bears draft a year to sit on the bench and watch them play without wide receivers, a running game, or an offensive line, and gives Angelo another year to fill the holes. Just like any roller coaster ride, I don't know if I'll be satisfied or disappointed when it's over, but I can expect plenty of twists and turns ahead. Grab the handle bar and let the screaming begin. A month ago, things made sense. The best team in the NFL was winning. The NBA West was predictably formidable while the East was predictably horrendous. And there was no fear that I would one day "misremember" anything. But things are no longer that simple. Since my last post, the Giants held up the Lombardi Trophy, a slew of trades threw the NBA into chaos, and we learned that even needles in Roger Clemens' behind can turn into a partisan affair. We live in a world where the Manning brothers have won back-to-back Super Bowls. Apparently anything is possible. Throughout it all, my intention was to comment on the insanity of it all. But that little thing called work kept interfering. I hope those who can make a career out of this appreciate just how lucky they have it. However, now almost three weeks post-Eli, the madness that was the NBA trade deadline has affected my team directly. Ben Wallace out, Larry Hughes in. This required my attention. Now before we begin breaking this down, let's make one thing clear. The Bulls were not going anywhere before this trade, and they aren't going anywhere after this trade. This trade cannot be evaluated on the same level as most of the other deals that went through these last few weeks. The Lakers getting Gasol for essentially nothing, this trade is not. The Lakers, the Suns, the Spurs - essentially every team in the West - were making deals to improve their chances of winning a championship. This deal was about John Paxson doing what he's been doing since he assumed the role of GM - divesting himself of players that are no longer helping. From Eddie Robinson to Eddy Curry, Paxson has made a living cleaning house of the malcontents that continued to bring the team down. The only difference this time, however, is that Paxson is now divesting the very players that he brought in. Now, my immediate interest is the Bulls, so my focus is on how I think this deal will affect the newcomers, as well as several current players. So let's start going through the list..
Ben Wallace - It's safe to say that this marriage was doomed from the start. Wallace never got over leaving his Piston teammates, and no matter how large those deposited checks were, the Bulls always remained the "they" that he first mentioned upon signing. He clashed with Skiles and continued to believe he could take any shot that didn't end with his hands grasping the rim. Bulls fans were expecting a lot for the price tag of this former Defensive Player of the Year, but in return, they received an aging player who showed that while he could still perform at times, becoming THE defensive post player versus A defensive post player was now beyond his basketball repertoire. His contract, although front-loaded, still far exceeded his production, and the Bulls were more than happy to part ways with Wallace and his paltry offensive skills - and that's not even mentioning his free throw percentage. Paxson tried to make a splash two years ago, and at the time, many thought it was just what the Bulls needed. But say this about Paxson, he won't hold on to players to make a point. He recognized that the experiment failed and took action to correct it. Now for all of those who want to bring up Tyson Chandler in this discussion, shall I pull out the game tapes from the Chandler years? Tyson Chandler, I'm sure, is a great guy. But he would have never succeeded here. Skiles broke him down to the point that he couldn't be salvaged. I was at a game where Chandler's final stat line read 0-0-0-0-0-5, with the last digit being fouls. Yes, he seems to have turned around his career, but I believe that has more to do with Chris Paul than anything. Heck, David West is an All-Star now. Joe Smith - Here's a player that surprised me this year. When he was signed, I was expecting a younger version of P.J. Brown that we saw last year. But Smith has easily been the most consistent player on the team this year. He has a nice shot and a high basketball IQ. But let's not kid ourselves. You don't build a team around Joe Smith. He is a very valuable piece on a contending team (e.g. the Cavaliers) but what is he going to do for the Bulls? He signed a short-term deal and wasn't going to be hanging around past this season anyways. If Paxson didn't trade Smith and he left after finishing his contract, everybody would be up in arms about wasting an expiring contract like he did with Brown last season. So yes, for the next couple years, the Bulls will have to face Joe Smith several times a year, but would that thought have stuck fear into the heart of Bulls fans before he brought his modest, yet solid, production to the United Center? I think not. Larry Hughes - Now we're getting into the interesting aspect of this trade. From what I have read, the inclusion of Hughes was essentially what kept this trade from taking place earlier in the day. I am sure Paxson will spin this to say that Hughes fits a need in this club but know that if he could have gotten this done without Hughes, he would have. Of course, in the NBA, contracts much match within 15%, so if you're going to unload a bad contract, be prepared to take one back. Just as the Bulls were ready to unload Wallace, the Cavs are happy they found somebody to take their malcontent. But from a basketball standpoint, there is potential here. From all accounts, Hughes is a guard that loves shooting the ball, has the potential to explode for 40 or struggle to reach double-figures, and either can't or won't play the point. To me, this sounds very much like Ben Gordon. Of course, the differences here are Hughes is tall enough to guard opposing shooting guards and has appeared on the All-Defensive team in the past. Now even if Hughes may never appear on that list again, I think we can all agree that we will not be seeing Gordon ever even get a sniff of that honor. So what does all that mean? It means that for a price of ~$13 million a year, we get a player who essentially is Ben Gordon with better defense. It sounds like a lot, but remember, Gordon turned down a contract of $50 million over 5 years, so really, Hughes isn't going to be much more expensive than Gordon would have been had he taken the deal (and probably the same cost it would take to sign Gordon now), and it will be for a much shorter period of time. Now I'm sure that Hughes' propensity to make bad decisions and jack up poor shots will eventually lead me to demand he be traded, much like it has done for my opinion of Ben Gordon, but what this deal does is give Paxson the flexibility of letting Gordon go via a potential sign-and-trade this offseason, removing the need to tie himself up with Gordon long term while testing out Hughes for a full season. If Hughes matures into a solid rotation guy with Thabo Sefolosha and Kirk Hinrich - a role that Gordon has never embraced - then Paxson can extend him before his final year. If not, then his contract would become one of the coveted "expiring" kind that Paxson can turn into another player. And yes, the same could have been said about Wallace's contract after next season, but the distinct difference is Wallace's impact on the salary cap would be "in addition to" versus "instead of". Joakim Noah and Tyrus Thomas are not going anywhere and Wallace's contract would just add to the front court payroll. But with Hughes, he's essentially taking the money that was allocated for Ben Gordon, not affecting the overall backcourt money. Drew Gooden - Apparently a little known fact about the NBA bylaws is that not only do salaries need to match, but unusual hair styles must also be within 15% of each other. Drew Gooden and his neck beard now find themselves paired up with his former Kansas teammate, Kirk Hinrich. Whether that will benefit either of these players remains to be seen, but what the Bulls get back in this deal is essentially a younger version of Joe Smith. Their stats are similar, each scoring just over 11 points with Gooden, and his size, getting a few more boards a game. Gooden will basically pick up Smith's minutes right away and join the rotation with Joakim Noah, Tyrus Thomas, and most likely, more of Aaron Gray. This lineup gives the Bulls a lot of versatility, as they now have a defender (Noah), athlete (Thomas), scorer (Gray), and rebounder (Gooden) all under 27 to mix and match against their opponents. I think Gooden's point total will increase with the Bulls as well, as they'll spread it around more than the Cavs, primarily because they have to. Additionally, Gooden got some Finals experience with the Cavs and should fit in well with this team, both on and off the court. He has an immediate friend in Hinrich, which makes it one more friend than I believe Wallace had in his time here. And at 26 years of age, he still has room for improvement in the coming years. Shannon Brown, Cedric Simmons - With players this young, the level of excitement and/or disappointment has to be tempered. Most likely added for salary cap reasons, Paxson and the Bulls get a cheap look at a couple of 22-year-olds for the remainder of the season. Cedric Simmons has the size to possibly get some minutes down low. And Shannon Brown... as an Illini fan, the best thing I can tell you about Brown is I hated him when he was at Michigan State. He just had intangibles that could help the team. Now, I don't know if that will translate in the pros, and he has been quite turnover-prone this season, but I don't think he'll have any trouble matching Adrian Griffin's production, and his contract is small and manageable, which makes him worth a look. Joakim Noah, Tyrus Thomas, Aaron Gray - This deal obviously opens the door for Noah and Thomas to pick up significant minutes between now and the end of the season. Noah had his well-documented dust-ups with Wallace, but the free-spirit has been playing well, and the crowd definitely is enjoying his energy in a season of lethargy. Thomas, who was on the verge of earning the dreaded "bust" label, has also been playing well with his time. With the Bulls going nowhere this season, the idea of these two kids getting more minutes. removing the negative Wallace influence, and letting us see exactly what we've got, is perhaps the best upside of this entire deal. It should also mean more minutes for Aaron Gray, who just moved up a step on the depth chart. While he's still glacier slow on defense, Gray has a few post moves that can lead to points. While he'll never be a star, he is just a rookie at this point who could develop into a solid bench contributor and a source for some immediate offense against the right teams. Ben Gordon, Thabo Sefolosha, Kirk Hinrich, Chris Duhon - There were already too few minutes to go around, and now Larry Hughes and Shannon Brown join the club. With six guards looking for time, it's safe to say that there will be some movement here this offseason. Nobody should get too comfortable, as rumors have surrounded pretty much every one in this bunch at some time in the last couple years. Gordon appears to be the most likely to go, as he will be a restricted free agent, and as mentioned above, Larry Hughes makes Gordon expendable. Duhon most likely isn't long for this team either, although there is less of an immediate answer for who will replace him. My only concern with this trade, however, is the status of Sefolosha. His development since the departure of Skiles and his insertion into the starting lineup is what Paxson envisioned when he selected him in the middle of the first round. His size takes pressure off of Hinrich, and he's willing to mix it up inside, which is a nice change of pace. And if the Bulls ever decide to go "small" and run it up the court, the combination of Hinrich, Sefolosha, and Hughes offers much more size than the Hinrich-Gordon-Duhon lineup I've seen thrown out there from time to time. Plus, with more time, Thabo's offense should also improve, but the issue is Jim Boylan is looking to secure a job, either here or elsewhere, and the appeal of Hughes' scoring might convince Boylan to forgo some development for a few extra wins. I would hope that Paxson has discussed this with Boylan, but as I said, this is the one area of concern for me in this deal. Cavaliers - It's apparent that Cleveland knew they had to do something. In one day, they got four new players for LeBron to reign over. The thinking is that Wallace can provide that inside presence for which he was known. Either Danny Ferry hasn't been paying attention, or the thought that pairing Wallace with Ilgauskas will move Wallace to a more relaxed role, letting him focus on what he does best. Joe Smith might actually provide the biggest boost to the team, taking over Donyell Marshall's salary slot but with much more productivity. He'll be a steady contributor, just as he was in Chicago. Wally Szczerbiak should provide a nice outside touch for when entire defenses collapse on LeBron when he's driving to the hoop. Will this get the Cavs back into the Finals? Perhaps. They potentially added some more consistent scoring and some rebounding. The question becomes can they gel in time. With the state of the Eastern Conference right now, they won't have to worry about it until Round 2, at the earliest. Sonics - Brought in to help finalize this deal, the Sonics essentially continue to clean house of large contracts. With no player signed beyond next year, the Sonics simply prepare for their eventual move. The trade isn't earth-shattering, and it still doesn't make up for missing out on Garnett and Gasol, but Paxson finally showed that he is willing to make some deals at least. Granted, the deals are to better position the Bulls for next season and beyond, but as previously mentioned, they were not going to compete for anything beyond the 8th seed this year. That became even more apparent after their loss to the Kidd-less Nets. With what should be a decent draft pick and some tradeable assets, the Bulls should be able to rebound next season after giving the kids some quality playing time for the remainder of this season. It's not a final product, but it's a start. Look for the divestment to continue this offseason. Of course, on the flip side, I convinced myself to jump back on the Patriots point spread bandwagon in the conference championship game and that cost me, even though I specifically said that they had not been playing well against the spread in recent weeks... again showing why I'm doing this as a hobby and not for actual cash... But now everybody is rested, and Bill Belicheck has had two weeks to prepare a game plan for Eli Manning. Let me repeat that... Bill Belicheck, two weeks, Eli Manning. I know Manning has played well this post-season, but it's still Eli Manning. Up until last year, Peyton wasn't exactly known as a big-game QB, so we know that there's a familial history with screwing the proverbial pooch here. The Patriots defense may bend more than it would like, but it hasn't been breaking. They're veterans and savvy and always good for a few big plays in a big game. Jacobs and Bradshaw will definitely test the Patriots throughout the game, but all in all, it's not exactly a matchup that the Patriots haven't managed to overcome... see Week 17, for example. On the other side of the ball, you have the Giants defensive line against the Patriots offensive line, which is essentially where this game will be won or lost. If the Giants can get pressure on Brady, then they can limit the big plays and scoring opportunities, keeping the game close late where anything can happen. But if the league's best offensive line can keep Brady's jersey clean, then you can expect an aerial attack that will completely tear apart the Giants mediocre secondary. I mean, R.W. McQuarters is running around back there. He was awful 5 years ago. Did he mysteriously get better now? I don't think so. So can the Patriots offensive line hold their own against the Giants. I'm guessing yes. They've done it against everybody else this season, especially the vaunted Jaguars and Chargers defensive lines the last two games. So you have the Giants offense evenly matched against the Patriots defense and the Patriots offense one step away (albeit a big step) from being able to score at will. And, of course, my favorite aspect of this entire game is the potential history involved. One way or another, the Patriots are going to be forever known for this game. Win or lose, it's a front page headline. But I've always been a fan of watching records be broken, not being close to broken. Hell, I still remember when the Buccaneers went 16-0 in the aforementioned Tecmo Super Bowl. Now that was an upset... But to get this close to perfection, this close to shutting up the '72 Dolphins, this close to forever being on the short list of greatest teams ever... it's tough to picture Brady and Belicheck screwing this one up. So why am I going with the Giants against the spread? Well, there are a few reasons. One, the Patriots, for as good as they've been this decade, have won their three Super Bowls by a combined 9 points. They don't blow people out. Up until early this season, they were never known for that. Two, the Giants can put up points too, and their defense can create opportunities for Eli and Co. And three, that's a pretty big spread. Granted, the AFC has dominated the NFC of late, but 12 points is quite the spread. And as I've mentioned, the Patriots haven't been doing all that well against the spread of late. With that being said, I think the two weeks between games really hurts the Giants momentum, while it allowed Brady to get fully healthy from however bad his injury really was. The Patriots give up points, but pull out the win, thus earning their 4th Super Bowl this decade, just like I predicted before the season began. As for their opponent... well, let's just say I was a little off on that half of my prediction.